Description: Meadowbrook subdivision - move in ready! Open plan has tons of windows & neutral paint/trim. 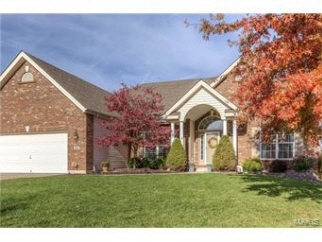 Vaulted entry leads to frml dr & gr w/flr to ceiling stone surrounding fireplace. Kitchen lovers find loads of counters, cabinets, bar, stovetop island, ceramic tile backsplash, pantry & stainless steel in-wall dbl-convection oven w/upr microwave & lwr oven. Hardwood floor flows throughout. Luxurious mstr ste w/lrg jetted tub, sep shower & walk-in closet! 2 lrg bdrms w/crpt & full bath completes main lvl. Continuing to amaze w/beautiful finished walkout lwr lvl w/family rm & 2nd fireplace surrounded by stone floor to ceiling w/custom wood mantle & dry bar. The 4th bdrm w/walk-in closet & full bath also found in lwr lvl. Huge backyard, alarm system, 3 car garage, handyman's workshop, two lwr lvl exits & too much more to list creates an absolute dream home. Subdivsion has clubhouse, pool & tennis courts. Top rated wentzville school district.